It’s almost Valentine’s Day and maybe you still can’t make up your mind about what plans you’re going to make with your loved one. If by any chance that you prefer a quiet night with your significant other and a candlelit dinner is what you want to do–I’ve compiled a couple of romantic, delicious vegan dinners that you can cook up for this special V-Day. Combine tomatillos, serranos, and 1 onion (peeled and roughly chopped) in a medium saucepan and cover with water. Bring to a boil over high heat then reduce to a simmer. Simmer until vegetables are completely softened, about 10 minutes, stirring occasionally to make sure all sides are softened. Drain vegetables then transfer to a blender. Add 3/4 of cilantro, a large pinch of salt, and 1 tablespoon lime juice. Blend on medium speed until a chunky purée is formed, about 30 seconds. Transfer to a bowl, season to taste with more salt or lime juice if necessary, and reserve. Cooled salsa can be stored in a sealed container in the refrigerator for up to 2 weeks. Finely mince half of remaining onion. Heat vegetable oil in a large saucepan over medium-high heat until shimmering. Add onion and garlic and cook, stirring frequently, until softened and light golden brown, about 4 minutes. Add cumin and chili powder and cook, stirring, until fragrant, about 30 seconds. Add spinach in batches, stirring and allowing each batch to wilt before adding the next. Cook, stirring, until excess moisture has evaporated, about 7 minutes. Season to taste with salt and pepper. Transfer spinach to a colander to drain, pressing out excess moisture with a rubber spatula. Transfer to a large bowl and fold in hominy. Set aside. Combine cashews, remaining garlic clove, chipotle, stock, and vinegar in the jar of a blender. Blend on high speed, adding water or stock as necessary to reach a thick, pancake batter-like consistency. Continue blending until completely smooth, about 2 minutes. Season to taste with salt and transfer to a bowl. Set rack to 12 inches below broiler element and set broiler to high (alternatively, set oven to 475°F). Spread 1 1/2 cups of salsa verde across the bottom of a 9- by 13-inch baking dish and transfer the rest to a shallow bowl. Working one tortilla at a time, dip tortillas into the bowl of salsa verde, coating both sides thoroughly. Place on cutting board and top with 2 to 3 tablespoons of filling. Roll up tortilla and place edge-down in baking dish. Repeat until all tortillas are filled. Spread remaining salsa verde over top of tortillas. Spoon cashew cream over the baking dish in a single line down the center of each row of tortillas. Transfer to oven and bake until cashew cream is lightly browned and edges of tortillas are beginning to crisp about 15 minutes. Thinly slice the remaining half onion and roughly chop remaining cilantro. Sprinkle on top of enchiladas and serve. Mix everything except the chives and parsley in a high-speed blender or food processor. Mix until smooth and creamy, stopping to scrap down the sides if necessary. If the mixture is too thick to blend, add a little more water a tablespoon at a time. Pulse in the chives and parsley. Chill the cheese spread in the fridge for an hour or two before serving. Whisk gluten flour with nutritional yeast, paprika powder, and salt. Mix water with soy sauce and add it to the gluten flour. Stir and form a dough ball. Knead for a minute to activate the gluten. Let the ball sit for a few minutes. Knead it for a tiny bit and then flatten it to a thick pancake. Cut the “pancake” into four pieces and massage each piece with your fingers to make them a bit thinner. Mix water with bay leaves. Bring to a boil. Then reduce the heat, so the water is only simmering but not fully boiling. This is important because that way the seitan will become thick and firm, not spongy. Now add the steaks and partially cover the pot. Let the seitan simmer for 30 – 40 minutes, until it’s firmer. From time to time, check the water, so it doesn’t fully boil, but only simmers. Drain the seitan and press out the excess liquid from every steak. You can use the leftover boiling liquid for making a delicious gravy. Gravy: I pan-fried some onions, then added seitan liquid and then a couple of tablespoons of vegan cooking cream. So good! Heat up a pan, add plenty of oil and cook the steaks until crispy on both sides. Now put the pan-fried steaks into a bowl and add 2 – 3 tablespoons of soy sauce. Cover the bowl with a plate and shake the bowl, so the steaks will be covered in soy sauce. Taste and add more soy sauce, if needed. Serve and enjoy! I really hope that you enjoy your vegan and healthy Valentine’s dinner with your loved one! Happy Valentine’s, everybody! Hope you had a romantic Valentine’s Day, Tammy! I really want to try the seitan steak dinner. Eversince my boyfriend and I became vegan, steak was the hardest for us to give up. This is something that my Valentine would really enjoy. Perhaps it’s time to show him my cooking skills. Gladys, your cooking skills is something to be proud of! Food that you made with love is the sweetest gift you can ever give to your loved one. That is honestly the sweetest thing ever! I’m not even a fan of Valentine’s Day and I’m single, but I’m looking this up because my single friends and I have decided that an all-girls group date should happen. This sounds really fun, Sarah! Valentine’s isn’t just for lovers, keep that in mind! I wanna try the spinach enchilada. You can actually experiment on this recipe. As long as you’re with the person you love, Valentine’s Day will always be a good day. This is funny! But seriously, if a man cooks for you and prepares everything, like with proper table setting and stuff, he’s a keeper! These look delicious. I love anything with spinach in/on it. I’ll definitely have to give this recipe a try. Looks yummy! Wow. The spinach green chili enchilada recipe was awesome. Thank you very much. OMG this is really incredible!!! I need to try this!!! Back when I wasn’t a vegan steaks were just my EVERYTHING and I have panicked to create a vegan version… super glad that now I will be able to!!! Oh I love enchiladas so much! Do you have a recipe for green chile enchilada sauce? I would really appreciate it if you shared one. Delicious as always, Rebecca. I love all of your recipes, keep them coming. Spinach enchilada with spicy cashew sounds awesome. I am going to try it this week. Your recipes look delicious. For me, a one person household, do you have simpler recipes? I don’t like so many ingredients. Thanks. I just made spinach enchiladas following your recipe tonight. So easy and delicious!!! Thanks, will make it again, double the recipe and freeze half! Yummy thanks! This looks good. I’ve discovered that spinach is not as bad as it tasted to me growing up. I even choose to eat it on occasion in salads or dips and this is worth a try. I have made these enchiladas twice already, and my fiance specifically asked for them for dinner tonight…which is a big deal because he usually isn’t much of a vegetarian meal kind of person. Such a great roundup! That herbed vegan cheese spread looks To Die For!! Can’t wait to try some of these! Seitan is expensive to buy and not that tasty… compared to homemade. Its easy easy to make. This recipe looks wonderful and will be dinner this weekend. These do sound tasty! I love the ingredients and all the dishes. Thanks for sharing the recipes. Fake or not this steak looks amazing! I’ll have to try this. Yummy! Thanks for sharing it. These look fantastic and I can’t wait to try them. I have been looking for a great vegan enchilada recipe for a long time. Thank you so much for sharing these, especially the enchilada! It’s my favorite dish and I am going to try this original recipe. I will let you know how it turned out. Hi, all of these recipes look great! Can you do a best Japanese vegan recipes post? Yummy! I love any type of enchiladas. I love spinach! Pinning this one. Definitely will try. These are really nice! By the way do you have a recipe for the vegan sweet potato nacho cheese? Hear hear! I’ve been eating these for lunch all week. I just feel bad that my husband hasn’t gotten any leftovers. lol Thanks for the recipes. Yummm! Definitely trying some of these recipes for lunch this week. Thanks for sharing! I made these spinach enchiladas for dinner tonight and they were delicious! I didn’t change a thing on the recipe. We are looking forward the leftovers tomorrow. These are all so awesome. I have tried each of them on different nights. My favorite part is how well the leftovers reheat. Just wanted to let you know that these recipes have made it in to my regular rotation! Your recipes look amazing, but I wish you would give us the calorie count on each of them . . . Please!! This recipe round up was a crowd pleaser for my family of picky eaters. I’m not so sure about freezing these but they were very easy to make and delicious. Thank you for sharing! OMG sooooo trying out the enchiladas! Just finding this gem of a recipe and I’m hoping to make it in advance for a girls weekend. Is it better to bake then freeze or freeze without baking? Love, love, love your recipes! Thanks! I make these wonderful enchiladas for my family all the time. I also add sautéed mushrooms to the spinach mixture. Wow! So delicious!! These sing to the part of my heart that loves Mexican! These enchiladas look incredible. Perfect for a quick lunch or week dinner. 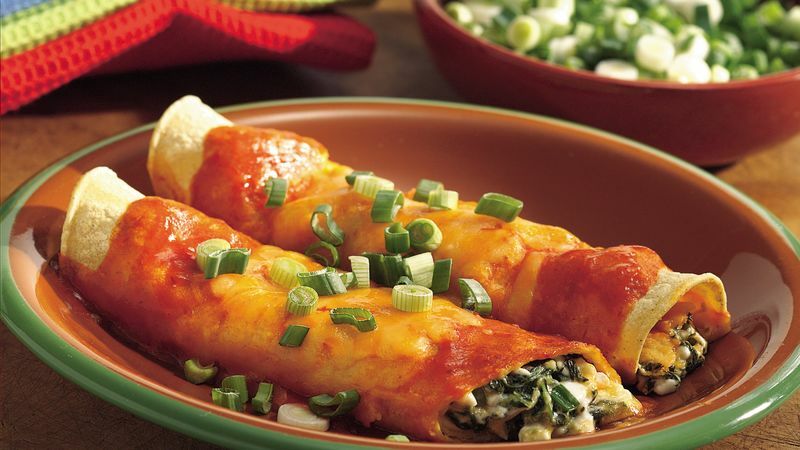 Spinach enchiladas for the win! Just made these and they were DELICIOUS! Will definitely freeze a second batch next time. Hi, Rebecca! Amazing spinach enchiladas. Tried it. Do you have the nutrition facts for this dish? Thanks! Everyone loved it! Very nice enchilada recipe! Love the addition of spinach. I was afraid that the burrito sized tortillas would be too big, but they were the perfect size to hold the contents of the enchilada.It turned out great. Thank you for the recipe! Look so delicious!!! I wanted to eat all of these at the moment I saw them.Thank you for sharing these food. I made enchiladas using this recipe today and my boyfriend hi-fived me after his first bite. Lol. They were so good. Thanks for the recipe! All the energy spent on vegan “meats” seems to detract from the whole vegan movement to me. We should be aiming to further vegan cuisine rather than trying to mimic the taste of corpses. That is scarily the best looking vegan steak I have ever seen. I’m definitely trying this out on my friends. These look amazing! Being alone on Valentine’s Day is rough…. But thanks for the recipes! Valentine’s day is over but thank you for sharing these lovely recipes. I will definitely try to make some of these for my family. Omgosh you need to open a vegan restaurant near Columbia MD. I will be your biggest customer. Randomly found your page, and appreciate all your content. Its always nice finding fellow chill vegans. Cheers. Wowwwwwww, I can’t believe this steak recipe… I’m so excited to try it!!!!!!! My man isn’t vegan so I would LOVE to shock him with this dinner and show him how fun and delicious vegan food is! I tried this recipe for Valentine’s Day. Very delicious. I am preparing again today. I made 4 vegan steaks. I can’t eat dairy or gluten, so many of my meals would be considered vegan. I miss cheese the most, but I hate paying so much for dairy free cheese. I will definitely try this out. Thanks! Excited to make this! looks so good and reminds me of the expensive vegan steaks you can buy at the store. Hubby will be happy. Wow!!!! 😛 Not vegan but cut red meat and looking for alternatives to lose weight. These look so good. Recently went vegan from eating meat 3 times a day for health reason but bbq’d mushroom burgers aren’t quite hitting the spot, this is a game changer! hopefully it’ll make the transition a little easier! I am feeling better than ever though so it’s all bonus points right now! VEGAN STEAK!!! Yessss, time to fool my meat eating relatives once more! 😀 Thank you! Vegan steak? Wow. I’ve been wondering how to make something like this… Can’t wait to try it!! I’m going to try cutting this steak into strips and use it to make vegan beef stroganoff. I’ll let you know how that turns out. Can’t choose just one… I want to try them all… And I am not even vegan!! Cant wait to incorporate these in my weekly meal prep!! Being a vegan and cooking things that look like meat? Same as a lesbian claiming she hates men, but goes and purchases a “man tool” for pleasure. Literally makes no sense. Nice. I have made vegan steaks before but I am going to follow your recipe. Keep up the good work. Just made these vegan steaks yesterday and they were so good!! My sister even liked them and she is a huge steak lover. Great recipe! Seitan steak? Hmmmm… Actually for me one of the reasons I went vegan was because I didn’t like meat and milk. Just made these! They’re awesome tasting. My kids even liked them. Highly recommended recipes. Thanks for sharing. The Seitan Steak looks so delicious. Has anyone here tried that? I’m not sure how it tastes. It’s an acquired taste but I must say that it does taste good. You should try it before Valentine’s night, to see if you would like it. I’m thinking that it’s your main course, so you don’t want to mess it up. Spinach Enchiladas lol? what would be like 5000 calories,,,I’ll pass!! but it looks pretty good. Looks yummy! We always do dinner at home and make our own dairy free chocolate covered strawberries. My husband was just saying to me, “Can’t we have some of that fake meat at least?” Nooo!! I’m gonna make Seitan Steak!! Yay! For those who say “Why make things that replicate meat”, I always reply with this…chickens don’t look like McNuggets. Cows don’t look like pot roast. Pigs don’t look like bacon. Humans have made them look like them. So now, we make plants look like them. What’s the problem? I am going to try these! Look so yummy. I also love that the ingredients aren’t anything I have to go out and get. Simple ingredients, delicious outcome! This would make a great base for country fried steak. Thanks for the recipe! Incredibly Delicious Enchiladas Rebecca, they look so mouth watering!! Want to try. Love the simplicity of your recipes. fab recipes as always thank you and will try these over the weekend. I just made these last night. It was my first time ever making seitan. They were so delicious and flavorful! Thanks for sharing the recipe! I’ll definitely be making these all the time now! I was never a fan of seitan but still kept trying new recipes. I’m so glad I made yours! It is the BEST seitan steak recipe! I love it and so did everyone in my household. Wow very delicious recipes! thanks for sharing such a tasty recipes with us. Really appreciate it. 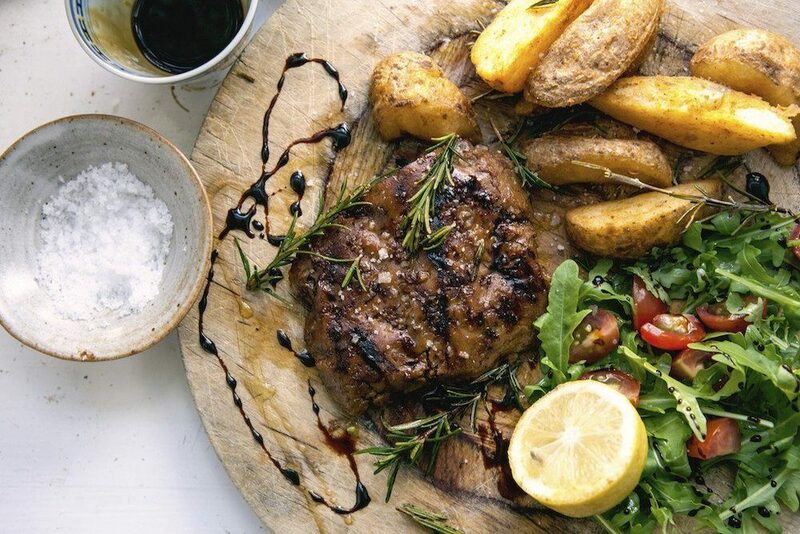 I would love to try this steak recipe, but in my family we all have gluten sensitivity therefore cannot consume seitan… Is there any chance to replace it? Those look so good! You nailed this one! Thanks so much for your recipes! Thank you so much for sharing your recipes. I enjoy trying them out. You are such a wonderful person. I am Mexican and these enchiladas look so very delicious. Blessings Rebecca. Those enchiladas look so good!! We love Mexican food!! Thanks for sharing your recipe!!! Made this last night and it was AMAZING!!!!!!!!!!! Omg!!! My husband hasn’t had a ‘steak’ since June 17 .. we went vegan in July. He loved it!!! Alot! Me too..even though I never ate barely any cow meat steak.. I loved this. Thank you😚 I shared it on Twitter too! I made your vegan steak tonight…and let me just say it was delicious and my meat eating husband, teenage son and daughter loved it..I just wanted to say thank you.. thank you..thank you..by the way it was their first vegan meal . Your enchiladas look delicious! Although I prepare them in another way… thank you so much for these wonderful recipes again! how many calories are typically in one serving? I would love to try this enchilada recipe out! Thanks a million for your wonderful recipes. You are a true inspiration to us. God bless you and your beloved family! Love this so much!! They’re all so mouthwatering! 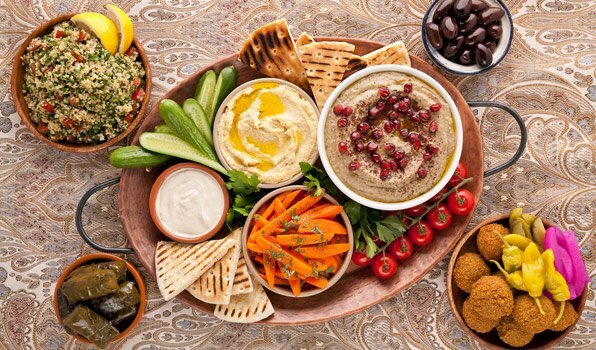 Dips are the best to enhance any meal! Do these have a wheat like flavor still? Some recipes that I’ve tried for seitán steaks have that wheat taste still. You’re making me crave Mexican food big time! 🙂 These look delicious…I can’t wait to make them! These dishes look fantastic! One is great for dinner and the other for dessert afterwards! oh my gosh … I want to eat all of these immediately. I will definitely be bringing at least one of them to family easter party! omg i wanna make this seitan steak with some mashed potatoes and mushroom gravy!!!! Enchilada looks delicious . I will have to try making them for tonight dinner. Thank you so much for your amazing recipe. Is it weird that I like how classy the vegan cheese dip is? All you have to do is pair it with wine! Oh yes! Great idea. Definitely a nice appetizer for Valentine’s dinner. Good lord they all look so good. I have saved these recipes to cook them later. Thanks for the recipes, Rebecca! You are awesome! Keep doing what you’re doing, you have a real talent and I love your positivity! I just bought some tortillas for the first time, and have no idea what to eat them with. Isn’t it sad? XD These recipes are a miracle! Enchiladas looks delicious!! thanks for the recipe. Definitely gonna try it. Can you please tell me what brand portable stove are you using. Thanks. I love your recipes.